Is there a better alternative to Adze? Is Adze really the best app in Desktop category? Will Adze work good on macOS 10.13.4? Dissect Recordings - Merge tracks that shouldn't have been split, or split tracks that should have. Delete undesired sections or extract detours as a separate track. Plan Routes - If you're planning an expedition, Adze allows you to plan the route and mark waypoints, check distances and view the proposed route on multiple maps before exporting the GPX data to a device. Tidy Documents - Optimise tracks to remove redundant data, change item names and colors, edit GPX document metadata and prepare your documents for sharing. Edit Points - Add, move or remove points graphically with the Edit Point tool, or use the points list to manually edit values. 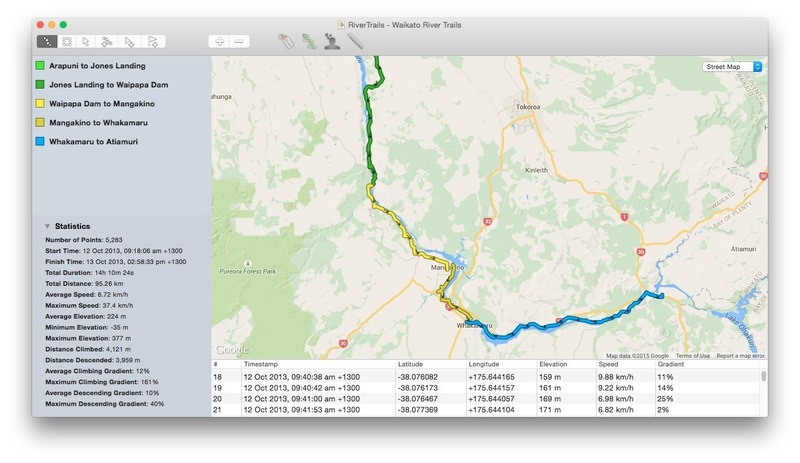 Identify Rest-stops - Adze can identify areas where you stopped for a rest, lunch, or an overnight stay and automatically split your tracks at those locations. Update Metadata - Change item names or colors and give your GPX document a title, author or description. Fix Timestamps - Offset timestamps by a fixed amount, overwrite them in bulk or remove them completely. Collect Statistics - View statistics about duration, speed, elevation and gradient for entire documents or selected sections. View Documents - View your documents on a road, topographic or satellite map directly within Adze or export to KML to view it in Google Earth.